Celebrate Holi in Vrindavan And Be A Part Of World's Largest Festival of Colours! Holi, the Festival of Colours has been celebrated in India for thousands of years and is now also celebrated by various communities of South Asia including non-Hindu communities. Holi will be celebrated on Thursday, March 21, 2019, all over the world with Holika Dahan preceding the festival on the night of March 20. The following weekend could be combined, and it becomes a great holiday option for everyone. While Holi is celebrated in almost every part of India, Holi in Braj is especially famous. Braj is a historical region which covers the area of Mathura, Vrindavan and some nearby areas. 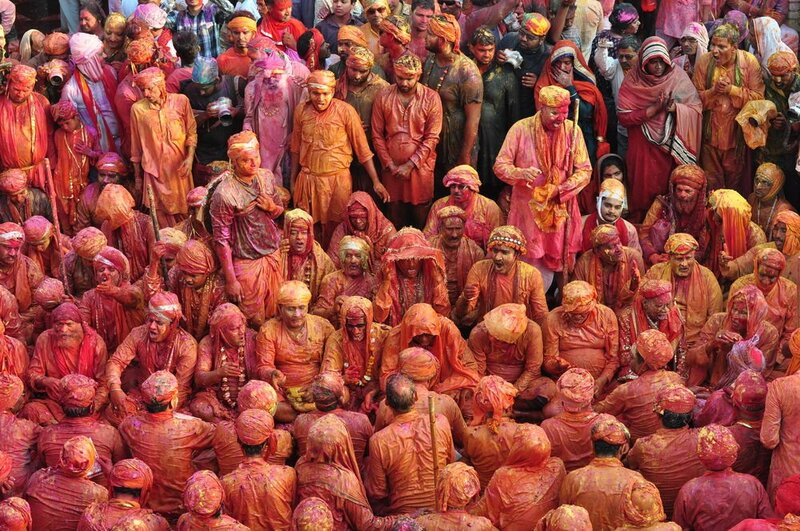 Holi here attracts tourists and pilgrims from all over the world because of its unique customs and traditions. Mathura is the birth-place of Lord Krishna, and Vrindavan is the place where he grew up in his childhood. When Krishna was young, he cribbed to his mother about Radha (his friend) being fair while Krishna himself was dark complexioned. His mother (Yashoda) suggested him to colour Radha with colours in a playful manner. Over the years, Krishna from his village Nandgaon used to go to Barsana (Radha’s village) to colour Radha and other Gopis. They also used to playfully beat him with sticks. And hence the tradition evolved. To make your trip planning easy, we have given below chronological order of festivities. You can choose to attend a few or simply plonk yourself in the town and experience the most colourful week of your life. Barsana Holi celebrations start about a week before the actual date of Holi. Barsana is a village near Mathura, and it was the village of Radha. 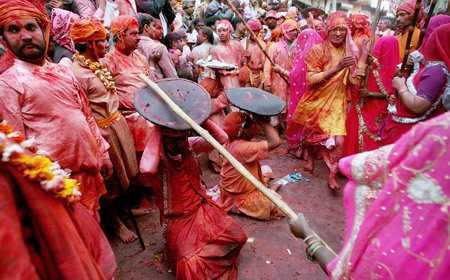 It is famous for its lathmar Holi in which women beat men (playfully) with sticks. Barsana is the place where Radha used to live, and Krishna used to visit this place to put colour on Radha. The Banke-Bihari Temple in Vrindavan is one such place to enjoy the festivities as it hosts a week-long Holi celebration here. During these days, the idol of Bihariji (Krishna’s another name) is dressed up in white coloured clothes and it is brought closer to his devotees to play Holi. Vrindavan Holi is played with coloured water and gulal, a form of colour made using organic substances like flowers and kesar. 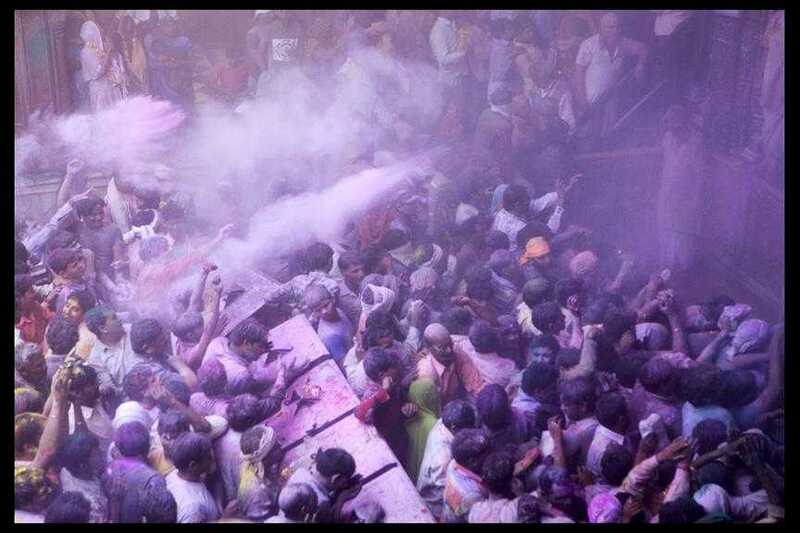 Goswamis (priests in the temple) sprinkle colours on everyone using buckets, water guns, etc. The whole atmosphere is made even more lively with music (bhajans) in the background and people dance to the tunes while enjoying the colors. 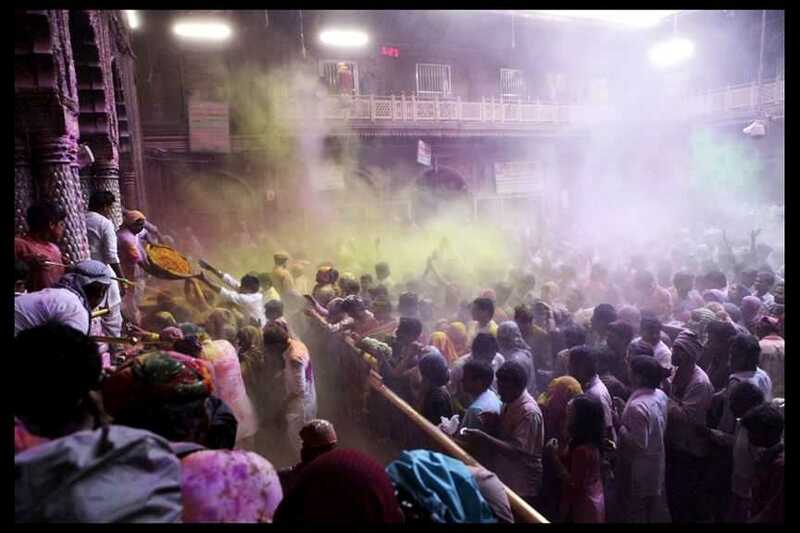 Holi celebrations in Banke Bihari Temple starts on Saturday, March 16 2019. Apart from Banke Bihari Temple, every other major Krishna Temple in Mathura and Vrindavan has some special celebrations going on for the entire week. The Gulal-Kund in Braj is also another interesting place to celebrate Vrindavan Holi. It is a small lake near the Govardhan hill. Local people act in Krishna-Lila drama and re-enact the scenes of Holi for the pilgrims. 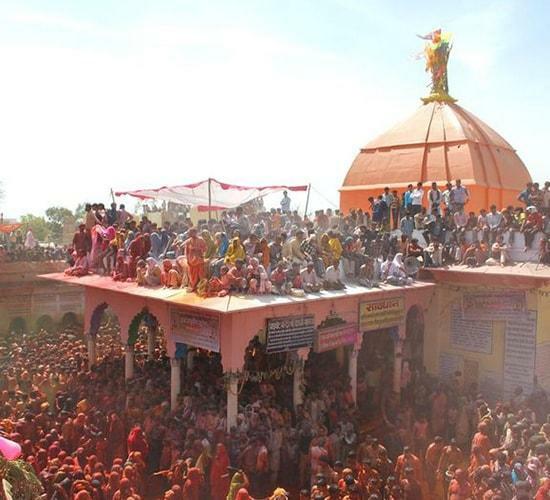 Dauji Temple (located 28 km from Mathura) hosts Huranga where men are beaten up by women. This is a centuries-old tradition that started when the temple was established. Women of the family that built the temple beat men in courtyarded of the temple and rip their clothes. After the ritual, everyone joins in to play Holi. Vrindavan has a lot of options to stay, but it’s best to book your room in advance. Most of the rooms here are simple and are available at very cheap prices (starting from INR 300 per night for a double bedroom). However, a few resorts and luxury hotels are also available in Vrindavan. The nearest railway station is at Mathura (12km) and the nearest airport at Delhi (142km). Taxis are available from Mathura railway station at regular intervals for Vrindavan. State buses connect Vrindavan to other neighbouring cities. 10 Amazing Festivals of Gujarat You Should Definitely Be a Part Of! Here is What You Need To Know About Losar - Tibetan New Year !